The 25 metre motor yacht Capital Two has had a central agency change and is now listed for sale by Rytis Babravicius at Ocean Independence. Built in GRP by UK yard Sunseeker International, Capital Two was delivered in 2007 as a Sunseeker 82 model. Her interior, in the yard’s signature black American walnut, sleeps eight guests in four cabins comprising a master suite, VIP suite and two twins, all with entertainment centres, television screens and en-suite bathroom facilities. 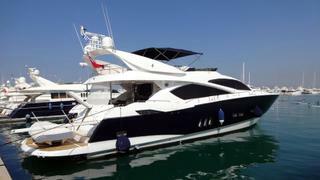 There is also accommodation for three crew aboard this yacht for sale. The spacious main saloon has a lounge area with two settees upholstered in leather and an entertainment centre including a 42-inch Sony television screen and a Bose stereo surround sound system. Forward to port is a well equipped galley with an American style fridge/freezer, while to starboard is a dining area with seating for eight guests. Directly in front of the dining area is the helm station with two helm chairs facing a full set of instruments. Up on the flybridge she offers another helm position, U-shaped leather seating, a bar, fridge and grill, and is protected from the elements by a Bimini top. For dedicated sun lovers, the foredeck has large sun cushions. Twin 1,550hp MAN diesel engines power her to a cruising speed of 22 knots, topping out at 32 knots. Lying in Marmaris, Turkey, Capital Two is asking €1,400,000 with VAT paid.